What's so interesting, lady? 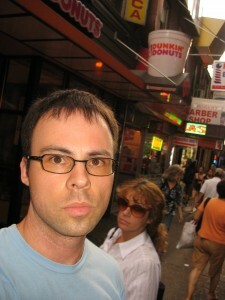 Haven't you ever taken a picture of yourself outside Dunkin' Donuts? Of the deal he made without fail. But get your paycheck safe to you. In your neighborhood, he’s in your neighborhood. Oh, the other marketing guy is smart it’s said. His writing brings the company cred. If there’s a fire anywhere about. Well, his words will put it out. They’re the people that you meet each day! I don’t go to that office anymore, what with the layoff and all. They even stopped putting money in my bank account for some reason. I spend much of the day in my dining room, in the company of two furry creatures who sleep and drool a lot. My trips out into the world give me some fleeting human contact. Over the last several months, certain individuals have become the new people in my neighborhood. You go to gym today? My answers are generally of the yes/no variety to ease the exchange. She’s probably saying more than I’m understanding. I don’t know much about her, except that she works a lot and her teenage daughter attends the school catercorner to the stand. Our conversations last the time it takes to ring up a basket full of fruits and vegetables and rarely stray from the aforementioned topics. Her boss – the old Korean guy in a “git r done” hat – is usually sitting right there and itching to ring up the next customer. And all the other fruits and vegetables that if they were organic would be collected along a trail. To get me the cheap berries blue. In your neighborhood, she’s in your neighborhood. The young Indian guy at the Dunkin’ Donuts knows what I want on sight… medium ice coffee, black. This is a high-traffic store on a high-traffic street corner. The 7 train station is directly above and trains rattle by, shaking the store, about every five minutes. The sidewalks are generally too crowded to walk in a straight line for more than a few steps. Inside are always the usual types of characters – a hospital employee on his way to work, a cop or two on a break, some gangly teenagers getting a sugar fix and an old lady of dubious residence with a plastic bag fetish. Random customers come and go. The cashier will yell out my order from wherever he is the moment he sees me. Sometimes he’s helping another customer. Sometimes he’s in the back, if it’s time to make the donuts. Sometimes he’s at home on his couch watching television. It doesn’t matter. I look up upon hearing his voice and nod. He brings my drink. I pay with exact change and leave. That is the extent of our interaction. There was some confusion a few months back over whether “black” coffee meant no milk or no milk and no sugar. That’s long since been resolved, at least as far as we’re concerned. This is the most basic of customer/cashier relationships. But I enjoy it for what it is. And his recognizing me does make me feel important for a few seconds every afternoon. That in itself is worth the $2.37. Oh, a Dunkin’ Donuts guy is brave it’s said. His store is orange, brown and, if there’s a police incident, maybe a little red. If Norm is near about. Well, my order he’ll yell it out! There are other characters around too. It’s a rare day that I don’t see the blond ponytail guy with the spiderweb tattoo on his shoulder. He’s generally rocking the mirrored sunglasses and the outsized attitude, like Dog The Bounty Hunter, with only slightly better hair. Sometimes he’s leaning against a wall, and looking important. Sometimes he’s holding court, and looking important. Sometimes he’s hurrying somewhere, and looking important. Jackson Heights has no shortage of characters, though no one else I see everyday. My interactions with the people in my neighborhood are brief, but I appreciate them for what they are. It’s nice to be recognized, to be appreciated outside of your own home. Work offers a sort of validation that unemployment doesn’t. Sitting at home alone all day can skew your reality. But a quick trip around the block can bring it all back into focus. This was written by Norm. Posted on Wednesday, August 5, 2009, at 5:32 pm. Filed under Benefits of Unemployment, Jackson Heights, Subways, Unemployment. Tagged 7 train, cell phone stores, Dog The Bounty Hunter, Dunkin' Donuts, eyebrow threading, Git r done, I Love NY, Midwest. Bookmark the permalink. Follow comments here with the RSS feed. Both comments and trackbacks are currently closed. Well now I know what you’re doing while I’m at work all day: getting really high. Working can skew your reality too. Working in Alabama produces a skewered and roasted brain. Nice post. I read your blog often. Love Amanda’s comment!!! Have a good day Norm. Norm, your posts invariably make me smile, and often make me laugh out loud (am I supposed to write “lol”?). I eagerly check your blog every morning before I start checking the various job boards (I was laid off in November), and I am always delighted when I find you’ve written something new. Thank you so much taking the time to describe your observations to us! You do it so well!! Thanks, Lia, for your kind words. And sorry for the delay in posting your comment, and in writing new stuff. My wife and I took a short vacation. I’ll be back at it this week.